Our Experience: 10 Years and Counting! If you are looking for an immersive and engaging RPG Dungeons & Dragons gaming experience, then prepare to get blown out of your seat! 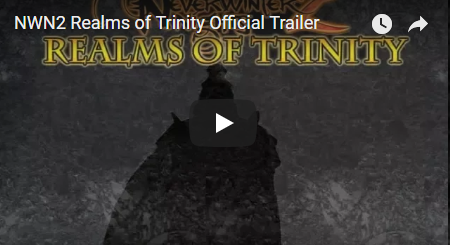 The Realms of Trinity evolves the Neverwinter Nights 2 engine to new levels across every possible front. We have redesigned the game mechanics, visual effects, areas, and much more. If you are craving a great story, RP player community, and a real adventure, then RoT is your place to play Dungeons & Dragons. The Realms of Trinity is classified under the Role Play category. If you have questions, we have answers and we have provided the following player resources to keep you connected and informed! A simple to use comprehensive tool that allows quick searching for ROT character Races, Classes, Feats, and Spells. Game client ehancement that fixes a number of crash bugs and adds some new features to improve your experience. We have a ROT group on Discord setup for all your voice chat and chat room needs. To join click here. Full catalog of creatures you may encounter during your stay at the Realms of Trinity. To help guide players on the community environment in ROT, please review our basic gameplay rules. All registered users on our Forum can submit suggestions, requests, and report bugs. Join our forum members and get access to the latest information, request system, product announcements and much more! 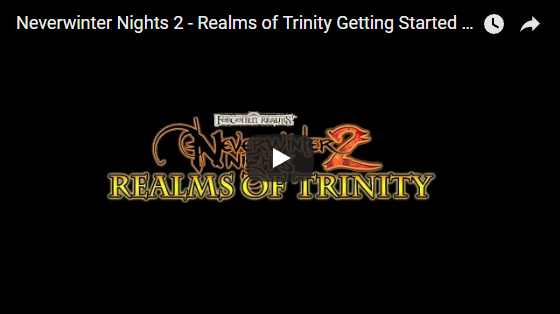 The Realms of Trinity incorporates many customizations to the Neverwinter Nights 2 experience. The following section highlights the key changes and features that we have made available to you. Watch our short YouTube getting started video! I have NWN2, now how do I connect to Realms of Trinity? To Play ROT: Start Neverwinter Nights 2, click "Multiplayer", then Click "Direct Connect" enter address: server.realmsoftrinity.com and connect. The client will download all necessary files needed to play automatically. The Realms of Trinity is a story based persistent world based in the ©Forgotten Realms Campaign setting. It takes place in the southern coast of the Sembian region several hundred years after the goings on in Neverwinter Nights 2. Once you begin the campaign, speak to Vaster Jarulson (The Captain of the Trinity Army) at the Trinity Government Building in Trinity Town Center. The areas that are Campaign related can only be adventured to depending on your current state in the story. You may return and "re-run" the campaign areas as many times as you wish once you have access to them. For more information on the Campaigns of Realms of Trinity, check out our Campaigns section. Important NPCs will have a yellow exclamation point floating above their heads. These are generally all NPCs that give or can give starts to quests or important to the story in some way. Epic Relvels and advancement to Level 40! Character development is essential in the Realms of Trinity. Hence, players will be rewarded for attaining experience above and beyond Level 30. This is called an Epic Relevel. When a player reaches certain thresholds of XP, you will be entitled to an Epic Relevel. You can claim your ER by selecting Releveling Options from your player menu or by visiting the Trinity Town Center Temple and speaking to the Releveler NPC.) You will be given the option if you have the XP amounts. A character will receive a total of 5 base ability score bonuses. These can be spread out as the player chooses. After the player chooses the 5 ability points, that character's ability scores will be modified. Then the character will be sent to our "Relevel Void", once there you will be set to Level 1 and the player will be able to re-level / rebuild your character as they choose. The thresholds are as follows: 1st ER: 1,000,000 XP, 2nd ER: 2,000,000 XP, 3rd ER: 3,500,000 XP, and the 4th ER: 5,000,000 XP. After 5,000,000 XP, you will gain a level for each million of experience you gain beyond that to a maximum of Level 40. Wish Shards, What are they? We like to Role Play, and if you do as much as we do, you can be rewarded for it! To enable RP award processing for your PC, you must be in RP Mode. ONLY local, whispers, and party chats will be processed. To turn on RP mode, you may click on the RP icon on the ROT HUD or by Shift+Right Clicking your character and selecting Player Modes->RP Mode. Every hour the system will scan your text and award XP to your character accordingly. Note: There is a max amount of XP per day and per hour you can receive in this manner. Also, if you like to play in a party, regardless of roleplay, we reward the entire party with bonus experience. Party XP rewards are based on your character level and the Challenge Rating of the creature killed. If a creature killed is 6 or more CR beneath your current level, you will receive no party XP bonus. The Realms of Trinity story is broken up into three in depth, multi-chapter volumes. Click the below images to find out more about each one! NOTE : This list will auto refresh every minute. This list ONLY shows players that are actually in game and playing. Players that are connected and Autodownloading content will NOT appear in this list, but WILL appear on NWNList.com site due to the fact that they are connected to the server. If you would like to support the Realms of Trinity financially, please click one of the links below to donate by using Paypal or Patreon. We accept donations for Set Items at $12.50 USD per item, and $.75 USD per rune level requested. Please be sure to include the item name or rune level in your donation notes. Items will appear in your inventory the next time you login after we process your donation and request. Please view the Set Items and Rune Cost Guide below for more information. We accept donations for in game gold. For every $1.00 USD that is received you will get 50,000gp, in addition for every $10.00 US dollars you donate, as a bonus, you will receive an additional amount of 100,000gp. For a $5.00 USD donation, we will email you a Excel Spreadsheet with every item that drops from a spawner and which area it can drop in. Note: This list does not include special drops for Extreme Difficulty kills, and random generated items on kill. Just by donating for any of the above mentioned gifts, you will attain the folling supporter statuses depending on your donation amount. All patron beneftis are active from the date your donation is processed and for the next 31 days. Donated $5 or more in total since RoT’s inception. Donated $10 in the past month. Donated $15 in the past month. Donated $20 in the past month. Donated $300 or more in total since RoT’s inception. Note: Patron options are available from the Wish Shard store menu under "Premium Supporter Options". These are "bonuses" to the value of the donations. You don't donate for these, but you're awarded them automatically. This means that if you donate $5 for wish shards you will also get the "Supporter" epithet. If you donate to get yourself a guild you will be a "Patron - Bronze" for the month as well. The development staff at the Realms of Trinity is continuously developing features and content. We have been at it for nearly a decade now, and you know what? All we're asking for is more players. The best way that you can help the server out is promote us through the various sites that we've laced our names into. Like us, share us, endorse us, vote for us... And you will have done more than what a donation could do to help us. For those that want to go an extra step, it would be great to have people drop a line in the comments sections or forum threads that we’ve started. The longer that a thread remains alive the more visible it will remain. Not to mention that the credibility will grow as more people post their experiences of the server. Thank you very much and see you in game! Like our Facebook Page and grab the special gift rewards code from our wall to get Wish Shards and gold credited to your account! Keep in touch for up to the minute news on scheduled events, news and promotions! RoT is what all PWs aspire to be.. or at least should. It's a massive world (370+ areas) and has bug fixes for effectively EVERY class. Warlocks have never been so gracious! This PW is by far the best I've ever encountered. The Developers, DM's, staff, players, all make this project fun, fullfilling, and downright amazing. The community is helpful, love to RP, and are courteous. Check it out, because you're missing out on a great experience. Dungeon Masters are the glue that holds a persistent world, such as the Realms of Trinity, together and is the reason why this server has nothing but some of the best and most experienced DM's in the NWN2 community. Below is a list of the DM's and a short profile of each of them.